In 2012, the School of Nursing, Midwifery and Indigenous Health at Charles Sturt University in New South Wales, introduced guest lectures from consumers of mental health services and their carers. These lectures were placed within the introductory mental health subjects of both the Mental Health Nursing and Paramedic undergraduate programs. 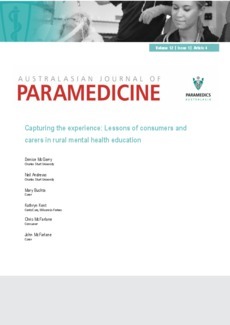 This paper describes this experience by combining the recollections of six key stakeholders: the non-government organisation (NGO) carer support organisation CentaCare Wilcannia-Forbes, a consumer, two carers, a student and the academic involved in the program. Each provided responses to five aspects: the background to the project, the gains from the experience, the personal hopes and concerns when the project was proposed, the perceived value of the project and finally thoughts about the future of the project. Risks are recognised at an individual level for students, carers and consumers of a re-traumatising nature, and of inadvertent reinforcement of pre-existing stereotyping or stigmatising positions. However, overall, the project was well regarded and is considered worthy of continuing, supported by some research to identify the germane elements.